Published in Rafu Shimpo, March 7, 1955. 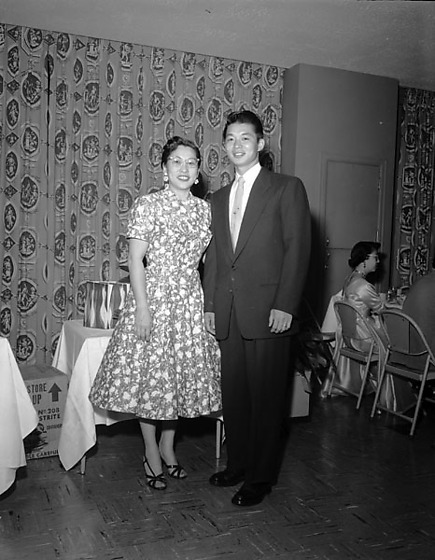 Portrait of Chiyo Tashima and Ko Aihara, all events winners of the ninth annual Japanese American Citizens' League (JACL) national bowling tournament, standing in front of a table at the tournament's awards dinner and dance at the Wilton in Long Beach, California, March 7, 1955. 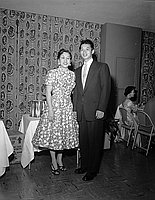 Woman in dress, high heels and eyeglasses stands next to man in a dark suit and light colored necktie. People sit at a table in background in background. Typed on original negative envelope: Long Beach Bowling Tournament. The bowling tournament was held at Virginia Bowl and Ken Mar Bowl. Chiyo Tashima had previously won all events for 1951, 1952 and 1953; she set a new 9 game mark of 1747. Ko Aihara of Long Beach topped the men with 1789.